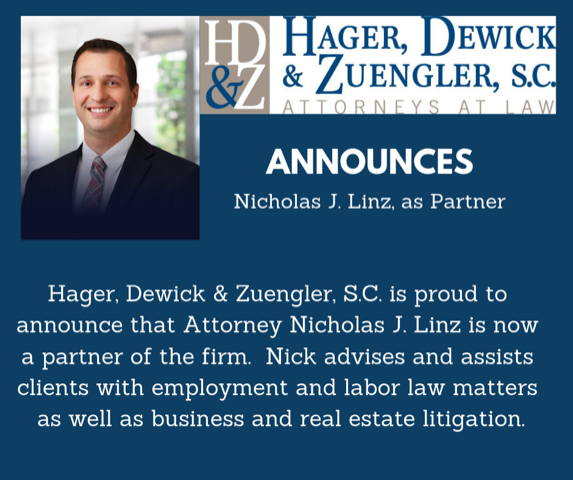 As a law firm, we have worked hard to distinguish what we do, but, more importantly, how we do it, as compared to other law firms in the area, this is The HDZ Way. This remains our goal as we have grown from three attorneys to seven attorneys and have seen our support staff increase from three to eleven. Anyone who has experienced significant growth in his or her business will admit that maintaining the culture that “brought you to the dance” whenmore and more people are running around the office is always a significant challenge. Given our business model, we have had this discussion with many of our business clients. The fact that we live the same issues our clients do enhances our ability to assist them. A client seeking business and estate planning legal services in Northeastern Wisconsin is fortunate to have several very qualified business and estate planning law firms, and even a few solo practitioners, to choose from. It has always been our goal to lead that group with the seven attorneys at our law firm, who focus solely on business and estate planning issues and the myriad of legal areas that entails. While a prospective client looking for legal services might talk to attorneys who each know the law, the critical issue becomes the ability to listen to the client to determine exactly what that client’s legal needs are and, more importantly, what that client wants to accomplish. Only by understanding the client and his or her objectives can we increase the client’s understanding, as well. It is through this exchange that we begin what we hope is a long-term and mutually satisfying relationship that addresses our clients’ legal issues as they arise. The generation that preceded ours seemingly felt that attorneys had a certain mystique which implied that the attorney, in his or her infinite wisdom, would recommend a course of action for the client to follow and that was that. Perhaps attorneys were not to be questioned and perhaps further there was a perception of a certain “stuffed-shirtedness”when dealing with attorneys. The idea of actually enjoying one’s trips into and through the legal process was almost unheard of. Well, our approach allows for some enjoyment. Almost twelve years ago (after the three original partners had been together for several years), we formed our law firm under a simple guiding principle that governs virtually every aspect of what we do. That is – “Relationships Matter”. Ours is not a practicepredicated on a single engagement or a single project, but on the development of relationships with our clients that will stand the test of time and that will result in additional engagements and projects in the future, referrals of friends and other family members and even having a little bit of fun at those times when having a little bit of fun is possible. “Relationships Matter” is what brings us into the office each morning and what dictates how we interact with our clients and how we advance our clients’ goals and objectives. When asked what “Relationships Matter” means, we smile and suggest that we care not only about the legal issues and the legal results, but the impact on the client and his or her family. We “give a darn” about those people who think enough of us to make us their attorneys. We carry the “Relationships Matter” mantra forward every day by personally assuring each and every one of our clients that we will do the very best we can do to advance their interests. In order to do so, we are committed to client communications that are second to none. We will return phone calls promptly. We will keep our clients advised, often at least on a weekly basis, as to the status of that client’s particular affairs. We will under promise and over deliver. To borrow the tagline of a longtime (and very successful) business client – we will do what we say we will do. As to how we will over serve our clients, it starts with exceptional client communication, of course, but our commitment to communication does not stop there. In order to bring the talents of our entire firm to the forefront to serve our clients’ needs and desires, we must have internal communications that are also second to none. As a group of attorneys, we review the list of every new client and every new project for existing clients for which we are retained. Each attorney has the opportunity to weigh in as to a particular client or a particular project. Through this approach, we are able to bring our collective experiences to serve all our clients. Internally, when multiple attorneys are involved in a particular situation, the primary attorney is responsible for providing timely updates to the other attorneys who are involved. The HDZ approach to the practice of law is to bring our collective experiences togetherand to have each client’s situation handled by the attorney best able and best qualified to doso, regardless of who initiated the client relationship or who is the primary contact. In prior lives, we all were involved in firms where certain attorneys adhered to the “siloapproach,” which meant that an attorney attempted, often with very limited success, to do every single thing and address every single issue for the clients that he or she was the primary contact for. By breaking down the silos and using a more horizontal approach, we assure our clients that they are having the benefit of the best attorneys for the job. We receive calls every day from new clients or existing clients who need additional work done. Clearly, the primary source of new clients is satisfied existing clients. Local accountants, bankers, financial advisors and insurance agents also make important and very much appreciated referrals to us. Our commitment to our clients and our commitment to those who make referrals to us is that we will always work as a team with the clients and their other advisors to advance each client’s goals and objectives. To anyone who has referred a client to HDZ, we thank you. Your having done so is the highest form of compliment we can receive and we will never lose sight of that. A prominent local health care provider with whom I have been involved for almost 30 years relies on the qualities of care, respect, joy and competence to set the standard for its business operations and advancement of its mission. We make that same commitment to our clients every single day, although we hope to emphasize the joy, for we must insist that we have fun whenever the opportunity presents itself. This is the HDZ Way.